Firstly, this printer offers greater print quality than any other 6 ink machine currently - and matches the capabilities of 8 ink machines. This is due to newly developed printheads which enable you to print up to 20% faster than say the previous hybrid printers (Z2600 and Z5600). These printheads have 2,400 nozzles per inch and use a dual drop weight technology for ultimate precision. This means HP no longer need to use Light Cyan or Light Magenta inks to achieve the widest colour gamuts. Ultimately these new state-of-the-art printheads will give you better and clearer readability, high contrast colour with greater definition and richer dark colours with sharper details. You can also enjoy smoother gradients for challenging colour combinations with the new "HP Pixel Control". 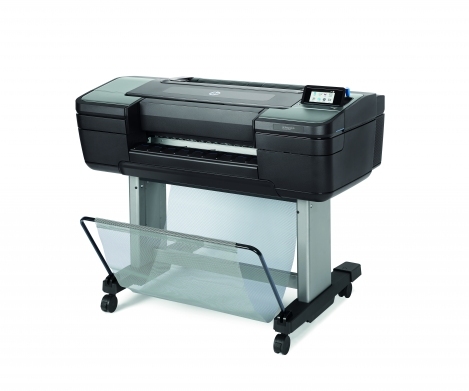 Next, HP have addresssed the issue of processing speed and also increased the print speed (up to 85.1m2 per hour). To address the processing speed, they've installed an Adobe PDF Print Engine which enables the most complex files to process within seconds and thereby freeing up your computer resources. 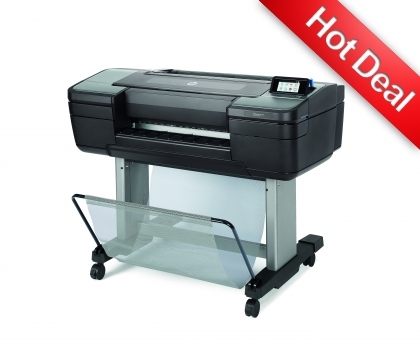 Sorry, there are currently no papers listed for the HP DesignJet Z6ps T8W18A 44" (A0) Printer & V-Trimmer at the moment. Sorry, there are currently no accessories listed for the HP DesignJet Z6ps T8W18A 44" (A0) Printer & V-Trimmer at the moment. Sorry, there are currently no spare parts listed for the HP DesignJet Z6ps T8W18A 44" (A0) Printer & V-Trimmer at the moment. Sorry, there are currently no support packages listed for the HP DesignJet Z6ps T8W18A 44" (A0) Printer & V-Trimmer at the moment.